If Congress fails to settle on a national budget by midnight tonight (April 8), forcing a partial shutdown of the United States government, the impact on NASA will reverberate all the way into space. A lengthy shutdown could even delay the next space shuttle launch, which NASA has pegged for April 29. NASA has posted a detailed plan on how it will respond to any government shutdown, should one occur, on its website, with one clear message: While the agency's nonessential government workers would be on forced furlough, all efforts will made to protect life and property on Earth and in space. But the workers preparing NASA's space shuttle Endeavour for its final launch on April 29 are not on the list of essential personnel. "If we have a government shutdown, essentially all shuttle launch processing grinds to a halt," NASA spokesman Allard Beutel told SPACE.com from the agency's Kennedy Space Center in Florida. That means that if a government shutdown occurs, but is less than nine days long, NASA could still have Endeavour ready to launch on its final mission to the International Space Station. "We would essentially be running through contingency days," said Stephanie Schierholz, a NASA spokeswoman at the agency's Washington headquarters. If the shutdown is longer than NASA's schedule cushion, a delay is possible but the space agency would have to re-evaluate its work schedule to see if weekend work could make up for lost time. A delay may also be prompted by astronaut training needs, since the crew that will fly Endeavour may not be able to practice some tasks as planned during a government shutdown, NASA officials said. The mission is commanded by veteran astronaut Mark Kelly, the husband of wounded Arizona Rep. Gabrielle Giffords, and will mark the final flight of Endeavour before NASA retires its shuttle fleet later this year. 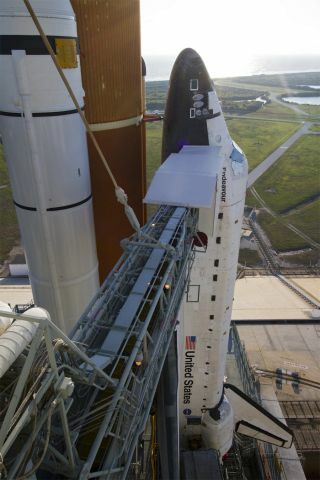 Only Endeavour's flight and one other shuttle mission (aboard Atlantis) are planned before the fleet is retired for good. There are, however, some exceptions at NASA to the forced government worker furloughs, should they be required. The American astronauts on the International Space Station will continue working normally, and will have flight controllers available for support at NASA's Mission Control center in Houston. NASA's modules on the space station will also remain open for business. "They're considered essential to operations," Schierholz said. It also means that ongoing robotic missions, like the Mars rover Opportunity on the Red Planet and Cassini probe orbiting Saturn, won't simply shut down. The mission managers for NASA's active science probes across the solar system have been meeting all week to identify essential personnel to keep their spacecraft running. The senior mission managers are deciding how "to keep the spacecraft or assets safe and make sure they are monitored," NASA spokesman Dwayne Brown told SPACE.com. "And if they are sending data, any data that comes down would just be stored."